In the Users & Groups pane (from System Preferences), click the New User button (plus sign) at the bottom of the accounts list to display the empty user record sheet. If the New User button is disabled and you can’t click it, click the padlock at the bottom left of the System Preferences pane and provide your password to unlock the Users & Groups pane. Select the access level for this user from the New Account pop-up menu. By default, the user receives a standard level account. You can also choose an administrator account, a managed standard account with parental controls already enabled, or a sharing-only account. The sharing-only account allows the user to copy or open shared files from your MacBook remotely (from another computer), but that user can’t directly log in to your laptop. In the Full Name text box, type the name that you want to display for this account (both in the Current User list and on the Login screen) and then press Tab to move to the next field. OS X automatically generates a short name in the Account Name field for use as your screen and buddy name in Messages and various network applications. The short name is also the name of the folder that OS X creates on the computer’s hard drive for this user. You can keep the default short name or type a new one, but it cannot contain any spaces. In the Password text box, type the password for the new account. 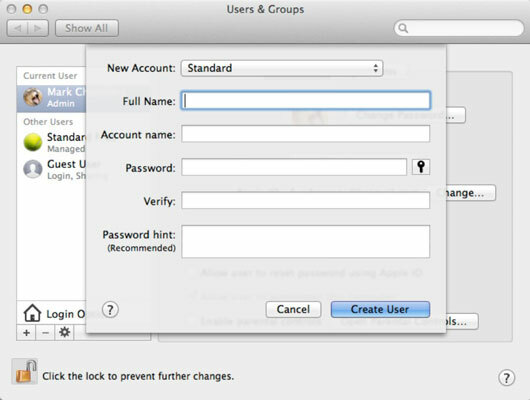 Click the button with the key icon next to the Password field, and Mountain Lion displays Password Assistant, complete with a suggestion. Click the Suggestion pop-up menu to see additional suggestions. You can choose the length of the password and select among several types: letters and numbers, numbers only, memorable, completely random, or even government-quality. Password Assistant automatically copies the current password you’re considering in the Password text box. As always, when you enter a password or its verification, OS X displays bullet characters for security. Press Tab, type the password in the Verify text box, and press Tab again. (Optional) If you decide to use the password hint feature, you can enter a short sentence or question in the Password Hint text box. From a security standpoint, password hints are taboo. Therefore, despite the recommendation that Mountain Lion shows here, it is strongly recommended that you skip this field. If you decide to offer a hint, keep it vague! Avoid hints like, “Your password is the name of the Wookie in Star Wars.” Geez. Click the Create User button to finish and create the account. The new account shows up in the Current User list and in the Login screen. Each user’s Home folder has the same default subfolders, including Movies, Music, Pictures, and Sites. A user can create new subfolders within his or her Home folder at any time. Here’s one more neat fact about a user’s Home folder: No matter what the account level, most of the contents of a Home folder can’t be viewed by other users. (Yes, that includes admin-level users.) In the Home folder, only the Sites and Public folders can be accessed by other users — and only in a limited fashion.